Once upon a time, a girl named Legend became bored. Organized chaos ensued. Disclaimer: I don't own Pokemon Special, the cover, or any pictures. The Dex Holders have time to save the world, but what about their everyday lives? Includes one shots. Disclaimer: 13thLegend does not own Pokespe, the cover, or any of the photos. Yes!My first book!Join Elesia in her mansion for some T or D! Is this Fate. Is this Destiny. We don't know but we have to accept this Destiny. "It was originally made to test the dexholders athletic and mental level yet it has come to serve another purpose; To transport us to where we'll gather the ingredients for the antidote." A new team has arisen in the pokespe world. Possessing a deadly weapon, their shadow slowly settles on the regions. Quick and silent in the underground. To beat this arising threat, the dexholders must create a long forgotten antidote. The only problem, the ingredients don't exist in their world. Professor Oak and Bill have created a machine, one with a way of finding the ingredients and training the heroes for the upcoming battle. Storyjumping. Sending the dexholders into worlds of books. Can Sapphire, Emerald and Ruby survive in Harry Potter? Will Gold prevail in Magnus Chase? Does Yellow and Red have what it takes to be part of Camp Half Blood? Can Crystal survive in the Hunger Games? The dexholders must fight their way through these make-believe worlds and find the key to defeating the evil team. The new threat is more capable than they originally thought. Will the dexholders find all the pieces and assemble them? Or will they fail miserably? "It wasn't fair, how they all broke apart and she stayed together." Moon, the female dexholder from Alola, has witnessed the downfall of her seniors from other regions. How they broke apart, distanced themselves, and chaos ruptured through the places they once sought to protect. Now, Moon suddenly realizes that she and her fellow dexholder Sun have the power to help them reconnect and possibly help save the regions from an unknown force. But the real question is: Can she gather them all in time, or will the world have to find a way to fight without their heroes? I do not own Pokemon special or Pokemon in general. I only own the plot of this fanfiction. I just saying if your looking for sun, moon x or y there in the chapters further in the story. I'm doing heavy editing cuz my early story writing sucked! Please call me crappy writer I like it! If I make mistakes when it comes to the manga feel free to let me know, it happened a few times already and I'm planing to fix them! This book has also become fairly popular in the pokespe Wattpad community which is sweet. Oh and thanks for 3k reads. This is a small collection of oneshots that I either wrote for myself, or other people have requested. Requests are my top priority, so when you request, that comes immediately before anything that I happen to be writing for myself. Sometimes it may take me a while to publish the chapter you request, because the requests can back up a little bit. Requesting a scenario helps me form ideas a little faster, but if there's nothing in particular that you want to see, then I'll try my best to portray a good chapter from my viewpoint of the ship. You can absolutely request any ship that you want. There's a lot of oneshot collections out there who only do requests if it's a ship that they ship, but I know how hard it is to find stories for a ship that you like sometimes. We all know the Dexholders lives are full of drama and adventure. The question is, how much of it is untold? In this collection of short stories, you'll find tales from our beloved heroes childhoods, never written quests, hilarious scenarios, secret moments and so much more! Also, there'll be some exclusive content that was not included from the "Storyjumpers"! What was Red and Yellow's reactions when they met Percy Jackson? Ruby, Emerald and Sapphire's fight on the Hogwarts train? The Hunger Games from Crystals perspective! So come in and explore with me the dexholders deepest secrets, most scandalous trips and embarrassing scenarios. Join in on the fun! Yellow just enrolled into a school quite literally larger than her hometown, how does she face her days after quickly being acquainted with the all so popular Blue Leaf and soon finding herself with feelings for the Red Fire. yea the bio is overexaggerated this is just a cliche story about yellow, red, blue and green don't expect much. 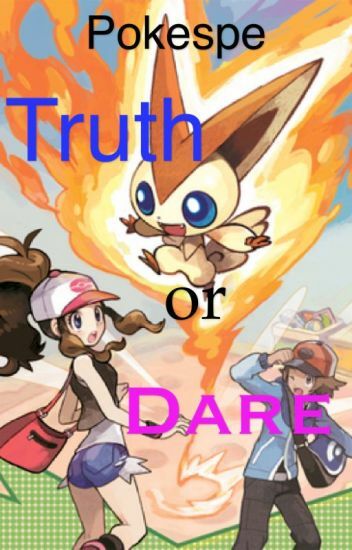 The Pokespe Character together playing truth and dare. Now let begin the tort- no I mean let fun.